The Advertiser has obtained the email, from Holden Hill Senior Sergeant Andrew McCracken to patrol officers on July 28, which listed five benchmark categories including the number of fines, reports and arrests each officer must obtain over five weeks. Officers who did not meet the benchmarks would be required to provide “an explanation” to Sen-Sgt McCracken and their immediate supervisor. Senior police now say the email’s directions were “outside of SAPOL‘s guidelines and policies” and it had been rescinded. To read more of this article from Adelaide Advertiser click here. 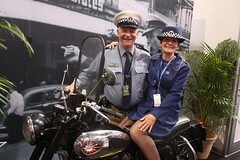 NOTE: Anna Bligh, our one time Premier of Queensland, told the Queensland Police, when commenting on a pay dispute on the local Brisbane television news, that if the Police wanted a pay rise, they would have to write more tickets. It might also interest people to know that it is the people’s BONDS that the Corporation that is the Government wants to get hold off, because they trade these BONDS on the Futures Market. This entry was posted in News Archive and tagged Arrest, Benchmark, Hutt Valley, Prohibition of drugs, Recreation, SAPOL, Sergeant, South Australia Police by renaissancelearningfoundation. Bookmark the permalink.